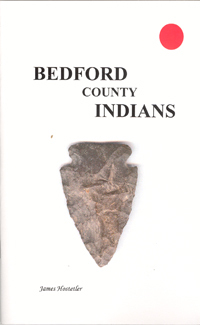 The following books and other items are also available for sale at the Bedford County Visitors Bureau office. Please note: Unfortunately we are only able to ship domestically within the United States. 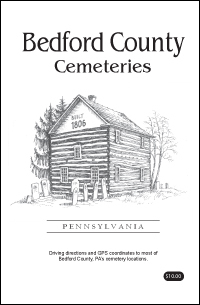 The Bedford County Cemeteries book is a guide with driving directions and GPS coordinates for most of Bedford County's publicly accessible cemetery locations. 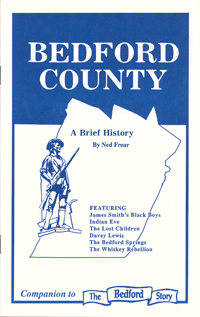 A brief and selective history, for the casual reader, featuring some of the stirring events and notable character in Bedford County's lively past: George Washington, James Smith and his Black Boys, Indian Eve, Davey Lewis the robber, The lustrous history of the Bedford Springs, and the story of The Lost Children of the Alleghenies. The records included in this book date back to 7800 years ago when men first entered the Raystown River Basin. From that point on we progress through time up to the last massacre of white men in 1782. 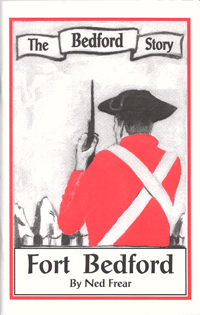 The artifacts, documents, dates and events included in this book, unless otherwise designated, were all from within the present borders of Bedford County, PA.
(Price includes all applicable taxes and shipping and handling)"
A mile south of Bedford, the grand old hotel represented a different world, visited by the famous, the powerful, the wealthy. 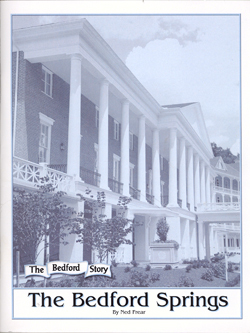 The Bedford Springs, for most of its two centuries, was a peaceful, hospitable sanctuary for visitors, particularly the politicians. Soon after it opened, the Springs began to attract prominent national figures. Aaron Burr, John C. Calhoun, Daniel Webster. Presidents Harrison, Polk and Taylor. And, of course, James Buchanan, year after year; forty years in all. It was all due to the magical qualities of the waters, and the promotion of the founding doctors. This grand hotel was restored and reopened the Summer of 2007. In a tavern near Bedford, in late 1815, a handsome stranger whose real name was Davey Lewis lost a back-room discussion with the sheriff, and was taken to court. Until then, he had been a free-wheeling, fast-talking operator in several states and in Canada. But in Bedford, he was sentenced to the penitentiary. He was let out of jail, and boasted no jail could hold him. But he couldn't stay out of jail. Three times, he would be brought to Bedford ... and three times, he escaped. Citizens let him out, other citizens brought him in. Big money was involved, but it never surfaced. And the handsome young robber, counterfeiter, gang leader died on the run, shot down by a gang of angry young men like himself. His arm ruined, his life threatened by gangrene, he refused amputation, and died in jail. Out of the mists of English history, the name of Bedford emerges. It is the name of a succession of powerful Dukes, one the tormentor of Joan of Arc, another the prop for king George III. In this name, a fort rises in the Pennsylvania wilderness, and a village endures to attract an uncommon community of families. Their relations and connections begin the list of famous names. The Bedford Springs brings more. Some come with the armies, some for adventure. Many are politicians. And some are native sons, gone out to make their names, Bedford, through its famous names, is common to many books of American History. 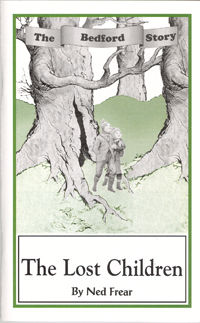 Two little boys, lost in the wilderness of the Allegheny Front in 1856 brought a thousand men from near and far to search the twisting hollows and steep ridges. 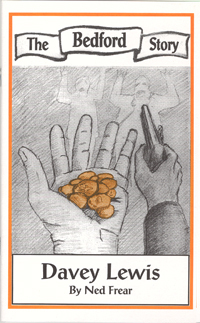 For two desperate weeks, they hunted in vain until a man named Jacob Dibert had three dreams, in which he found them. The story of the Lost Children of the Alleghenies has always been compelling. With the full awareness of those troubled times, it becomes even more dramatic. 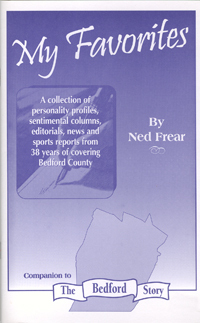 A selection of Ned Frear's favorite writings over 38 years. "It is extremely difficult to choose the few we can print, because there have been so many inspiring, fascinating people to write about. Many others could be included. I tried to disregard the editorials on subjects that vexed me, and chose columns that still move me." says Ned Frear. 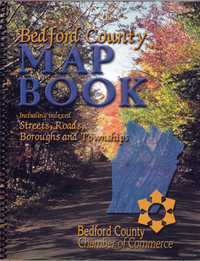 The Bedford County Map Book reflects the changes in road and street names throughout Bedford County resulting from implementation of 911 service in the area. Be sure to check out out shopping page to find information on a variety of stores in Bedford County. 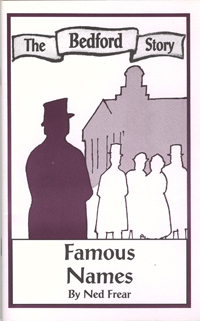 Contact us today for a free copy of our annual Visitors Guide!